Once started out as a novelty gag gift, this remote is just extremely funny to look at with its jumbo sized soft buttons. Anthony Sullivan can hardly stop laughing in this infomercial blooper. Take a look! Remote is compatible with most major brand of devices. Check the manual to make sure your TV is listed. Large soft buttons are easy to see and push. Code search feature can discover your remote codes automatically. Sleep programmable power off timer. 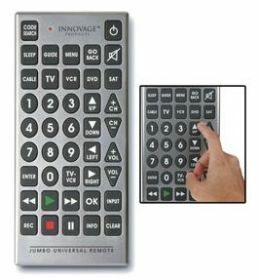 Super sized jumbo remote is 11"x5". Virtually impossible to lose or side under the couch.